Located at the base of the Four Seasons Austin Hotel, TRIO benefits from an ideal location with a front door to the city and a back door to Town Lake. It also suffers from the common challenge of being a “hotel restaurant.” Unjustly or not, many diners, particularly locals, penalize a restaurant for being located inside of a hotel. Almost as though the throngs of people passing in front of its doors somehow cheapens its offering or lessens its need to remain competitive . To the contrary, I find these restaurants when located in upscale properties such as the Four Seasons overcome this chip on their shoulder by trying a bit harder. And who can argue with available and accessible parking in downtown Austin these days? We are democratic when it comes to suggesting venues to review for the Finicky Four, but I must admit that I did move this selection to the top of the list after TRIO was recently awarded “Best Service & Best Steak” by Matthew Odam, food critic at the Austin American-Statesman, quite a dubious award to receive in the middle of cattle country. Frequent host to numerous charity events, weddings and host to rocking morning shows for SXSW in conjunction with KUTX, the Four Seasons is a familiar face to many Austinites. TRIO has undergone a gentle renovation which opened the seating in the entry bar area but left the popular booths and outdoor patio dining intact. Alisa, The Gluten Fee, Dairy Free: The mood should align with your food. Outside of being one of the Finicky Four, I’m also an ambassador of service at every place I enter. The brand integrity and reputation of Four Seasons didn’t disappoint. Walking in at 8p to unwind from a stressful day to enjoy dinner and cocktails was met with really off putting music that felt left over from the Happy Hour rush with larger crowds. At the request to change it, I quickly realize this was a corporate call where levers couldn’t be shifted locally. As a live music capital of the world, seemed only natural that the experience, audience and amazing meal align with the genre of music being played. Oh well, on to dinner. My personal concoction of a Anejo Tequila Manhattan on the rocks was the best heavy, pure gluten free start to the meal. While the amazing pop over breads were served, it was minutes later the gluten free, dariy free bread was offered. #nicetouch. The server (who didn’t miss a beat or a beet) greeted our table with the regular menu and a Glut en free menu – without question, only suggestion. Service was granted and appreciated. I ordered the steak, rosemary cut fries with aoili and brussel sprouts. You can go wrong with a filet that is perfectly cooked and seasoned. As if the balance of my meat, potato and greens weren’t enough, they offered their 3 signature sorbets for dessert. Coconut topped the list but the prickley pear and mango ginger were equally enjoyed. There is no better way to end the night with valet greating you with a warm seated car and a thank you for joining us Ms. Weldon as you depart. All in all, its an experience worth trying for yourself. Best part, I walked in with yoga pants, boots and a layered shirt after a long day at the office and I was received openly. Tracey, The Vegan: At Trio, there’s a limited menu for vegans: one appetizer (remove cheese), one salad (remove cheese) and sides. Still, that didn’t stop me from having one of the most delicious vegetable plates I’ve ever eaten. I gave the chef carte blanche to provide whatever inspired him — and his creation was inspired in its simplicity, technique and in the quality of the ingredients. Underneath, a bed of mixed quinoa. Above, beautiful carrots, green beans, broccolini, caramelized cauliflower, crispy brussels sprouts and yellow tomatoes — all drizzled in a savory oil. 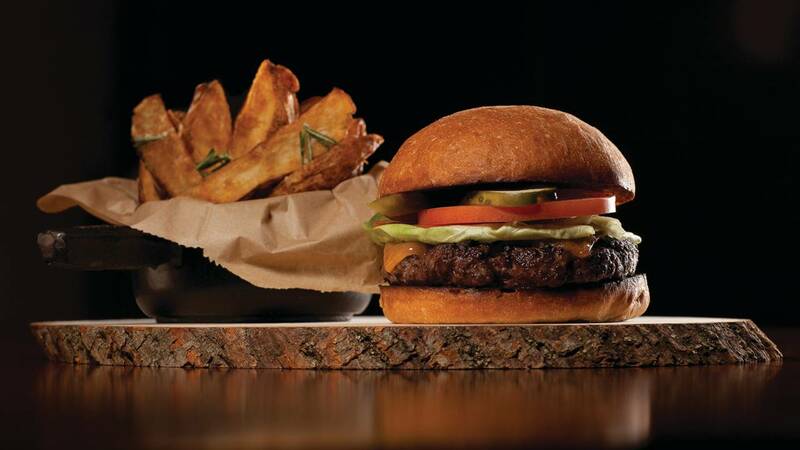 For an indulgence, ask for a basket of rosemary steak fries. Amazingly tasty. I wish Trio would offer a vegan-friendly wine (organic too would be ideal), but I wasn’t suffering with my martini made from organic, gluten free vodka. I’d go back to Trio any day. Enjoy, vegans. Lynn, The Omnivore: As an omnivore, I have never met a menu I didn’t like! And as someone who loves to cook, I rarely order dishes that I can cook for myself at home. There is nothing worse than sitting down with a dish and realizing that not only could you have made this yourself, you likely could have made it better. With that said, I find TRIO’s steaks hard to beat and I love to grill. Not sure if it is just me, but I tend to order my steaks here a shade more rare than other places. I like my steaks with a warm red center which is usually medium rare. Here, medium rare tends to come out a little more pink in the middle. A quick coversation with the server always helps make sure you get what you want. Alice, The Guest: I am from Louisiana and I will eat anything. Additionally, I really don’t need it to be an upscale restaurant to impress me. In fact, some of my best meals have been around the table of small, family run kitchens. So impress as they might with a renovated dining room, I am all about the food. Ok, I am all about the food and the drink. I found the cocktail menu confusing a bit overdone. Opting for the Tito’s and tonic, I felt that I could perhaps settle in to this place. My dining partners wanted fine dining, but I just wanted a burger. Seriously people, this is still Austin, right? Burger was big enough to take some home with me for a bit of a midnight snack. But there were no french fries left.